OSWEGO — Director Ellen Wahl of the Retired and Senior Volunteers Program at SUNY Oswego plans to visit Oswego County Opportunities dining and activity centers in November to meet current and prospective RSVP volunteers. Deirdre McCarthy, center in back, manager of Oswego County Opportunities’ Constantia Dining Center at Bernadette’s Bistro, and RSVP volunteers Janice McGraw, left, and Anne Pierce serve lunch to June Dickenson. This month, Ellen Wahl, director of SUNY Oswego’s RSVP, plans to visit OCO dining and activity centers around Oswego County to reach out to current and prospective RSVP volunteers. Nov. 13: Phoenix Dining and Activity Center, call 695-4841; lunch is meatball sandwiches. Nov. 14: Sandy Creek, 298-5020 (chicken and biscuits). These sessions may appeal to anyone 55-plus wondering, “What is there to do?” or who feels they want to give back to the community, but don’t know where to turn. Those attending will have the chance to meet informally with the RSVP director and discuss mutual interests. 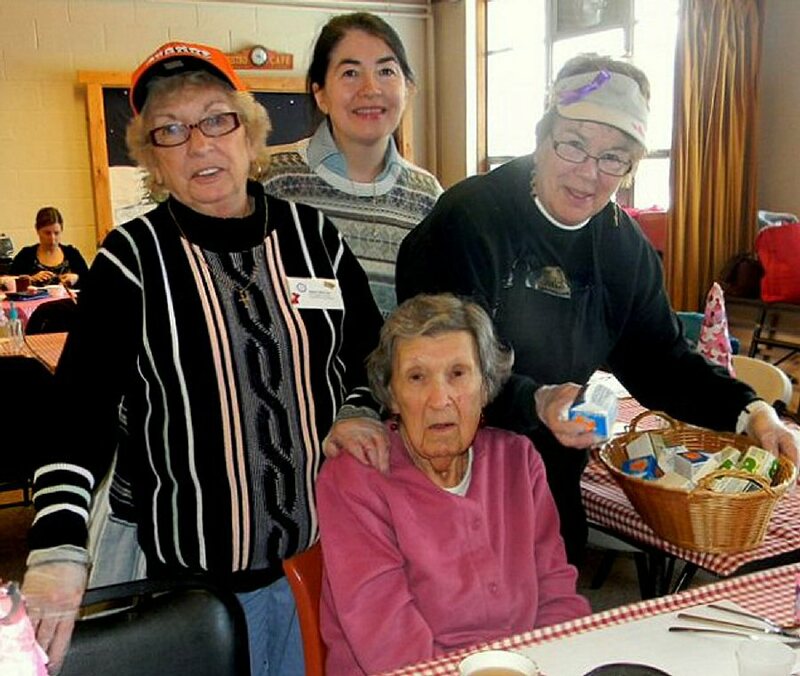 Dining and activity centers are the heart of OCO’s meal delivery service to seniors, through home delivery and in congregate settings. The centers also serve as community hubs for various activities of interest to older adults. RSVP collaborates with more than 100 agencies and programs in Oswego County, including OCO, to encourage and foster the development and maintenance of volunteer opportunities that engage, support and enhance the lives of Americans 55 and older, while responding to the priority needs of the community. Nationally, RSVP reached its 40th anniversary milestone this year. It is part of a nationwide network of Senior Corps programs, sponsored by the Corporation for National and Community Service. Each of the more than 700 programs in the United States is sponsored by a non-profit agency; in Oswego County, RSVP is sponsored by and is a division of the SUNY Oswego Office of Business and Community Relations, and is a United Way agency.